Like most of you, I'm thinking seriously about the New Year and what I want to accomplish. My goals are ambitious, but that's the point, right? Okay, looking at this, I kind of want to pee my pants a bit. But I also really, really want to do it all. To prepare for my über, ridiculously successful 2014 that I'm totally going to accomplish (totally), I've been reading the routines of famous writers. Their routines were interesting, as were some of the superstitions (seriously, Jack Kerouac, the moon was not out to get you), but none of them told me anything new. The consensus won't blow your mind. Whether it's "snap-writing," where you fit writing into the tiny chunks of time you find yourself with throughout the day--five minutes here, eleven minutes there--or hiring a babysitter once a week, or carving out a chunk of time before the kids are up or after everyone is asleep. Writers write. "If you'd be just as happy knitting and mothering or scrapbooking and mothering as writing and mothering, then by all means, do those instead. But if you can't, then you know who you are and what you need to do." I know what I need to do. I know what all of us who call ourselves Mommy Writers (Mormon or otherwise) need to do. Not because it's a hobby or something we do to pass the time when we're out of bonbons and have finished reading the latest issue of Harper's Bazaar. But because we love it. Because we can't stand the suspense, wondering what the characters in our minds will do and how the stories racing around our brains will end. Because we'd rather have dusty blinds and a pile of laundry up to our ears than not do what our soul yearns for. Good luck to all of you in the New Year! Wow, Katy. Go you! My resolutions are quite a bit smaller, but I think the best one really is to just write. Write write write. You are awesome and you can do it! Haha! You're right--these aren't too different than my goals were last year, except I shelved the other book I was querying and am starting fresh with these two! Good luck to you, too, Kasey! Love your list of random acts of service! We're starting a random acts of service project on our Facebook page & our blog too for 2014! If you are interested in being one of our guest bloggers; email me! Hope you don't mind if we use some of these great ideas on our page! Thanks so much for sharing these! 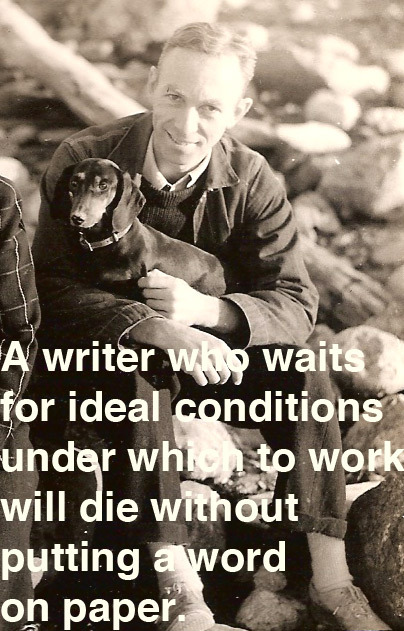 EB White's comment is so true! Such a good reminder! Writing happens in the middle of life, mess and all. I've had a slump the past two weeks, been sick, the holidays....I have to get back to the computer! !